–Synonyms—Liquiritia officinalis. Lycorys (thirteenth century). Habitat :The Liquorice plants are shrubs, natives of South-east Europe and South-west Asia, as far as Persia, the G. glabra ranging more especially to the westward, the G. glandulifera more to the eastward and being the source of the Eastern Liquorice root of commerce. The liquorice plant is a legume (related to beans and peas) and is native to the Mediterranean and cultivated in countries such as Greece, Spain and Italy. It is one of the most commonly used herbs in Western herbal medicine and has a very long history of use as both a medicine and as flavouring. Extracts of the root are used to flavour tobacco, beer, soft drinks and pharmaceutical products, often to disguise unpleasant flavours. Fresh English liquorice is bright yellowish brown; the root being soft and pliable. The root is harvested in the autumn and is dried for later use. The aroma is strongly reminiscent of anise or fennel. The taste is dominantly sweet, warm and medical. Liquorice plants are not particularly ornamental, with a disquieting habit of folding up their leaves at the end of the day. This perennial plant grows 90 to 180cm (36 to 72in) tall, it an extensive branching root system. 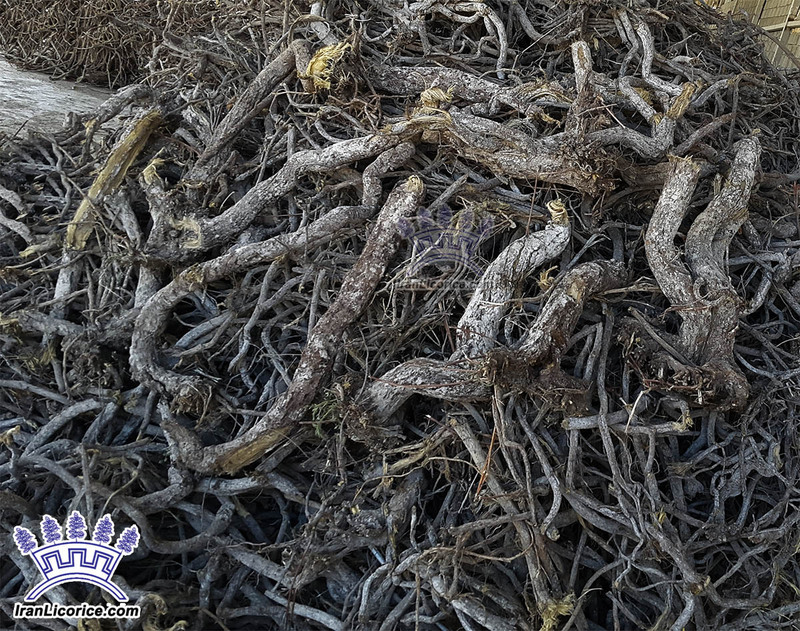 The roots are straight pieces of wrinkled, fibrous wood, which are long and cylindrical and grow horizontally underground. Licorice roots are brown on the outside and yellow on the inside. In our northerly climate the plant rarely flowers, this benefits it’s sweet flavour, as once the plant flowers the sweetness of the root is reduced. They are suitable plants to continue to be grown in large pots. This will control their root system and make it simple to access the roots to utilise if desired. Pre-soak the seed for 24 hours in warm water and sow spring or autumn at around 20°C (68°F) in a greenhouse or cold frame. Seed germination is low and irregular. Prick out the seedlings into individual pots when they are large enough to handle, and grow them on for their first winter in a greenhouse. Plant out in well-fertilised soil after last frost in deeply dug fertile moist soil in full sun. Plants are slow to settle in and do not produce much growth in their first two years after being moved. The young growth is susceptible to damage by slugs and so the plant will require some protection for its first few years. Each root if unrestricted can reach a depth of 90 to 120cm (3 to 4 ft) and can extend to 10m (25 ft). For good root development and harvest prevent plant from flowering. One acre of land can produce 4 to 5 tons every 3 to 4 years. Divide the plant in spring or autumn. Each division must have at least one growth bud. Autumn divisions can either be replanted immediately or stored in clamps until the spring and then be planted out. Pot up the smaller divisions and grow them on in a cold frame until they are established before planting them out in the spring or summer. Dig up the plant in early autumn, cut part of the roots off and replant the plant, it will continue to grow. Cut the root into 20cm (8in) pieces and dry for later use. The root can be used raw or used as flavouring. 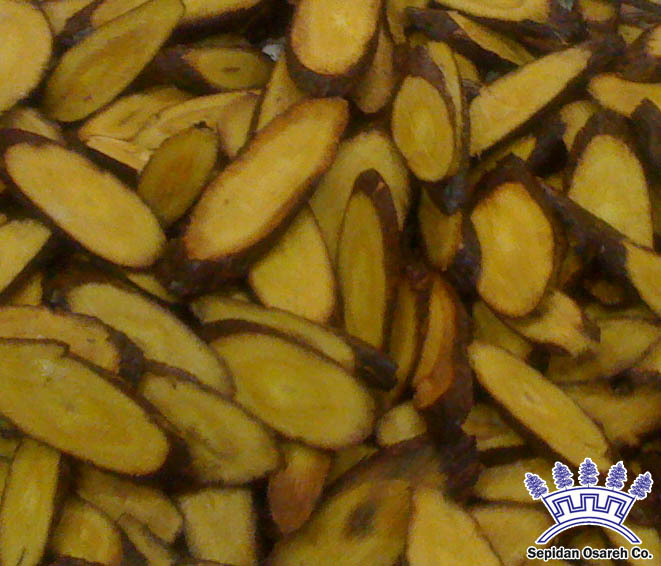 The dried root is often used for chewing; it is excellent for teething children and also as a tooth cleaner. A tea made from the roots is an excellent thirst quencher. The powdered root is also used as a sweetener in other herb teas. Glycyrrhizin is said to be up to fifty times sweeter than sugar. In todays confectionery it is often mixed with sugar and treacle. Liquorice supplements are made from the roots and underground stems of the plant. The health properties associated with Liquorice are well documented – it contains a natural expectorant so it can help soothe coughs and colds; it offers digestive relief by decreasing the amount of stomach acid and can help reduce stress and anxiety. Excessive consumption is known to be toxic to the liver, cause water retention and raised blood pressure. Glycyrrhiza glabra, commonly known as Liquorice grows wild around the Mediterranean and Asia. It is cultivated in countries such as Greece, Spain and Italy. Dioscorides gave the plant its botanical name Glycyrrhiza. It is taken from the Greek glukos meaning ‘sweet’ (from which we also get the word glucose) and riza meaning ‘root’. Its 13th century English name was Lycorys, a corruption of glycyrrhiza. In many parts of the world including the U.S. the alternative spelling of Licorice is used. The root of Glycyrrhiza glabra, the plant from the Mediterranean, including Spain, is sweet enough to be sucked in its raw state. In northern counties of England it is colloquially known as Spanish, supposedly because Spanish monks grew liquorice root at Rievaulx Abbey near Thirsk in Yorkshire. The dried root of Liquorice were sold as sweets, and commonly called Spanish Wood Stick or Liquorice Wood. They were one of the few sweets sold during the WW2 and during rationing. European liquorice is a plant with a rich historical tradition. The use of liquorice dates to ancient times; liquorice roots were found in the tomb of Pharaoh Tutankhamen (1358 BC). The ancient Romans and Greeks used liquorice for medicinal uses, such as in coughing syrups or against stomach ulcers. In 1305 Edward the First placed a tax on liquorice imports to finance the repair of the London Bridge. Liquorice has been grown in England since the Dark Ages and records from the early 16th century show liquorice being grown in fields around Pontefract in Yorkshire. It was brought from the Mediterranean by Dominican monks who settled in the area around Pontefract Castle. The plants didn’t flower in the cold climate, but what really mattered were the roots. The Dominicans used the liquorice juice extracted from the roots of the plant primarily as a medicine, for easing coughs and stomach complaints. The famous Pontefract cakes, also known as pomfrets, were born in 1614 when Sir George Saville first applied a stamp to the small, round liquorice cakes. Initially, these cakes were consumed as a medicine, then, in 1760, an enterprising apothecary named George Dunhill hit upon the idea of adding sugar to the already famous Pontefract Cakes, turning a primarily medicinal product into an immensely popular sweet. Mr Dunhill then set up his famous firm, and in the following years it became one of the most renowned English manufacturers of liquorice. Cultivation continued until well into the 19th century, when it finally petered out because of the competition from cheaper imported raw liquorice. The Liquorice of medicine and commerce is derived from the sweet root of various species of Glycyrrhiza, a genus which contains about fourteen species, natives of warmer temperate countries in both the New and Old Worlds, ten of them having roots more or less sweet, but most of them not sufficiently so to be of use. Hundreds of tons of Liquorice for commercial and medicinal purposes are imported annually from Spain, Russia, Germany, France and the East, most of our supply coming from Spain and Italy. There are several well-marked species: G. glabra, glandulifera, echinata, etc. The chief source of the drug is G. glabra, which is cultivated in England, but is imported chiefly from Spain and Italy. There are several other varieties in commerce – Russian and Persian Liquorice – but these are not recognized by the British Pharmacopceia as suitable for medicinal purposes. The use of the Liquorice plant was first learnt by the Greeks from the Scythians. Theophrastus (third century B.C. ), in commenting on the taste of different roots (Hist. Plant. lib. IX. 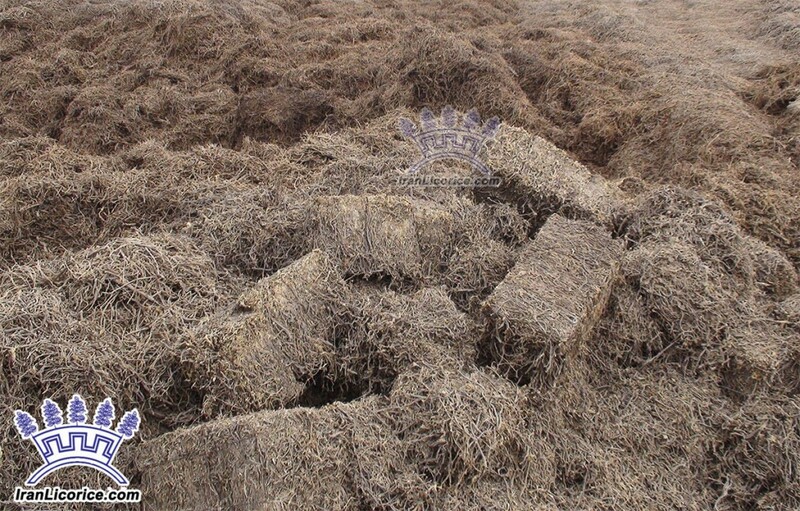 c. 13), instances the sweet Scythian root which grows in the neighbourhood of the Lake Maeotis (Sea of Azov), and is good for asthma, dry cough and all pectoral diseases. Dioscorides, who names the plant Glyrrhiza (Greek glukos, sweet, and riza, a root), from his description of the plant possibly had in view G. echinata, as well as G. glabra. The plant is often found under the name Liquiritia officinalis. The Latin name Liquiritia, whence is derived the English name Liquorice (Lycorys in the thirteenth century), is a corruption of Glycyrrhiza, as shown in the transitional form Gliquiricia. The Italian Regolizia, the German Lacrisse or Lakriz, the Welsh Lacris and the French Reglisse have the same origin. The Roman writers, Celsus and Scribonius Largus, mention Liquorice as Radix dulcis. Pliny who describes it as a native of Cilicia, and Pontus makes no allusion to its growing in Italy. Liquorice Extract was known in the times of Dioscorides and appears to have been in common use in Germany during the Middle Ages. In 1264, Liquorice (apparently the extract, not the root) is charged in the Wardrobe Accounts of Henry IV. Saladinus, who wrote about the middle of the fifteenth century, names it among the wares kept by the Italian apothecaries and it is enumerated in a list of drugs of the City of Frankfurt, written about the year 1450. A writer in the first half of the sixteenth century notices the Liquorice plant as abundant in many parts of Italy, and describes the manner of making the Succus or Extract by crushing and boiling the fresh root. The plant is described as being cultivated in Italy by Piero de Cresenzi of Bologna, who lived in the thirteenth century. As a medicine, the drug was well known in Germany in the eleventh century, and an extensive cultivation of the plant was carried on in Bavaria in the sixteenth century, but it is not mentioned in mediaeval lists of plants. John Parkinson grew Liquorice in his Holborn garden and John Josselyn gives the recipe for a beer which he used to brew for the Indians when they had bad colds. It was strongly flavoured with elecampane, liquorice, aniseed, sassafras and fennel. Liquorice is official in all pharmacopoeias, which differ as to the variety or varieties recognized, as to the botanical name employed and as to the drug being peeled or unpeeled, dried Liquorice root being supplied in commerce either with or without the thin brown coat. In the latter state it is known as peeled or decorticated. The British Pharmacopoeia requires that it be peeled, but others require that it be unpeeled. —Description—The plants are graceful, with light, spreading, pinnate foliage, presenting an almost feathery appearance from a distance. The leaflets (like those of the False Acacia) hang down during the night on each side of the midrib, though they do not meet beneath it. From the axils of the leaves spring racemes or spikes of papilionaceous small pale-blue, violet, yellowish-white or purplish flowers, followed by small pods somewhat resembling a partly-grown peapod in form. In the type species glabra, the pods are smooth, hence the specific name; in others they are hairy or spiny. Various indications point to the habit of this plant of fixing atmospheric nitrogen, as do many others of the family. In the species glandulifera (W. and K.) the pods are covered with thick, glandular spines, and the whole plant is pubescent or roughly glandular. The underground portion is not so spreading and produces a carrot-shaped root larger than the Spanish root derived from G. glabra. This species is indigenous to South-east Europe, Syria and Western Asia, and is both wild and cultivated in Russia. Both the Russian and Persian Liquorice of commerce is derived from G. glandulifera, the Russian reaching this country is peeled or unpeeled: its taste although sweet, is accompanied by a more or less perceptible bitterness. It consists chiefly of roots, not runners. 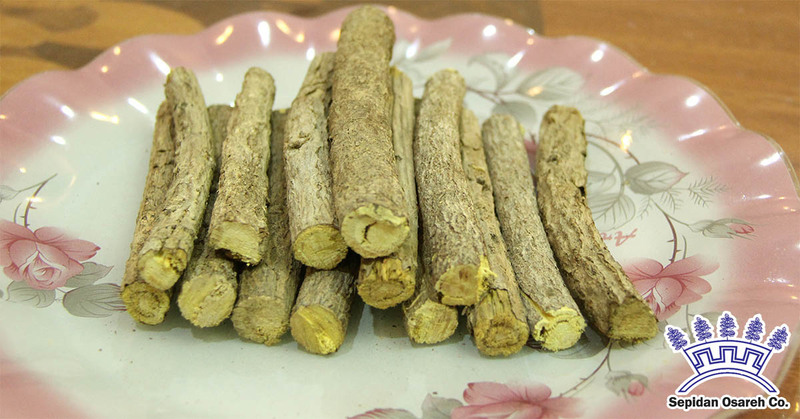 Persian Liquorice root, collected in the valley of the Tigris and Euphrates, from G. glandulifera, and exported in bales from Bussorah, is usually unpeeled, and is in rather large, coarse pieces, closely resembling the Russian root. Both the Russian and Persian varieties are largely consumed in the United States the root of G. glandulifera is equally official in the United States Pharmacopaeia with that of G. glabra. G. echinata, a native of Hungary, south Russia and Asia Minor, is the official German species. It has short globular heads of flowers and a small, ovoid pod with long spines. Probably a portion of the root from Italy and Sicily is the product of G. echinata, which grows wild in Apulia. The root is also somewhat bitter and there are contradictory statements concerning its quality, due perhaps to its having been confused with G. glandulifera. Asiatic Liquorice is obtained from G. uralensis (Fisch. ), found in Turkestan, Mongolia and Siberia, and little inferior to the best Russian Liquorice. G. lepidota (Pursh), American Liquorice, is a species of the north-western United States. The rhizome is said to resemble that of Spanish Liquorice, but is smaller. It is only grown now to a very limited extent in this country, being cultivated on a small scale near Pontefract in Yorkshire, though formerly it was extensively grown at Mitcham in Surrey, also at Godalming, and at Worksop (Notts). The English Extract of Liquorice, made from the fresh home-grown root, sold in the lozenge form and known as Pontefract or Pomfrey cakes, is said to have a more delicate flavour than that imported, and it is considered that the cultivation of English Liquorice might well be extended, Essex and Surrey being suitable districts for its growth. In southern Italy, large quantities of Liquorice root are grown, but it is chiefly converted into Extract, though some of the root is exported. Spain and the south of France furnish quantities of carefully dried Liquorice root. Up to the year 1890, the cultivation of Spanish Liquorice was small or moderate in comparison with the wild collection. Owing, however, to the depletion of the natural supplies of root of good quality, this cultivation has grown rapidly in South and South-central Europe, where the climate is favourable. Liquorice grows best on sandy soil near streams, usually not being found in the wild condition more than 50 yards from water. It will not flourish on clay and prefers the rich, fine soil of bottom lands in river valleys, where there is an abundance of moisture during the growing period, but where the ground bakes hard during the hot, late summer months, when the dry heat is very favourable for the formation of the sweet constituents. The plant succeeds most in a warm climate; not only can it not endure severe freezing, but cool weather interferes with the formation of its useful juice and renders it woody. It has been found that a climate particularly favourable to the production of the orange is favourable to that of Liquorice. Owing to the depth to which the root penetrates and its ready propagation from detached pieces, the plant is a most persistent weed in cultivated grounds where it is indigenous and exceedingly difficult of extirpation. It is very healthy and robust and very little subject to disease, at the same time successfully occupying the ground to the exclusion of other plants. For this reason, the continuation of the natural supply may be considered as assured, though it is liable to suffer severe reduction from over-collection. The supply of natural root has suffered severe fluctuations owing to the exhaustion of supplies in the districts previously worked, alternating with over-production from newlyopened districts. This fact, coupled with the operations of speculators, has resulted in equally great fluctuations in quality, the new districts yielding full-grown root of good quality, the older ones that which has not been allowed to develop properly. The cultivation of Liquorice is easy, sure and profitable and, if properly conducted, conducive to the betterment of the soil. On account of the depth to which the root strikes when the plant has room to flourish, the soil should have a good staple of mould 2 or 3 feet in depth and be manured if necessary. The planting season is either October, or February and March; the latter is preferred. The plants are procured from old plantations, being waste from the harvesting process, consisting of those side roots or runners which have eyes or buds, cut into sections about 6 inches long. They are dibbled in, in rows 3 or 4 feet apart, about 4 inches underneath the surface and about 18 inches apart in the rows. In the autumn, the ground is dressed with farmyard manure, about 40 tons to the acre. During the first two years the growth is slight, the plants not rising above a foot the first season, and in Calabria the intervening space is generally utilized for the production of potatoes, cabbages and similar crops. The soil being heavily fertilized for the production of Liquorice, these crops are usually very luxuriant. After the second year, the growing Liquorice plants cover the entire soil to the exclusion of other growth. Not until the end of the third season will the roots be ready to take up for use, but harvesting generally occurs only in the autumn of the fourth year. The soil is carefully removed from the space between the rows to a depth of 2 or 3 feet as required, thus exposing the roots and rhizomes at the side, the whole being then removed bodily. The earth from the next space is then removed and thrown into the trench thus formed and these operations are repeated continuously. Every portion of the subterranean part of the plant is carefully saved, the drug consisting of both runners and roots, the former constituting the major part. The roots proper are washed, trimmed and sorted, and either sold in their entire state or cut into shorter lengths and dried, in the latter case the cortical layer being sometimes removed by scraping. The older or ‘hard’ runners are sorted out and sold separately; the young, called ‘soft,’ are reserved for propagation. The average yield per acre is from 4 to 5 tons. The same ground yields a crop every three or four years, the fourth-year growth being the best. That of the third year and earlier is deficient in sweet substances, but immediately after the fourth year the texture begins to take on a tough, coarse and woody character. It is desirable also to collect the roots of those plants which have never borne fruit since that process exhausts the sweet substance of the sap. English-grown Liquorice is dug up in late autumn and sold mostly in the fresh state for making extract, only a small amount being dried. Fresh Liquorice (English) when washed is externally of a bright yellowish brown. It is very flexible, easily cut with a knife, exhibiting a light-yellow, juicy internal substance, which consists of a thick bark surrounding a woody column. Both bark and wood are extremely tough, readily tearing into long, fibrous strings. The root has a peculiar earthy odour and a strong, characteristic, sweet taste. Most of the dried Liquorice root imported into this country comes from Spain and Russia, supplies of the official drug being drawn chiefly from Spain, the better quality of which comes from Tortosa and Alicante. 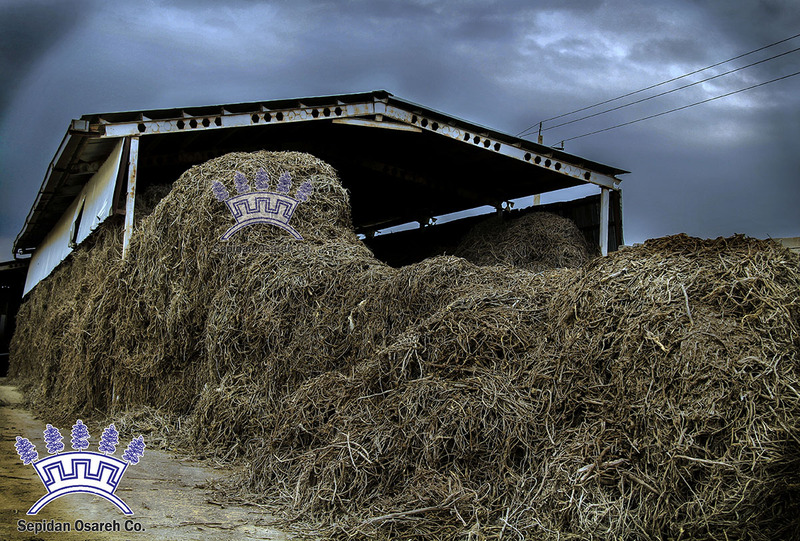 Both Spanish and Russian Liquorice are usually exported in large bales or bundles, or rarely, in the case of the Spanish variety derived from Alicante, loose, or in bags. 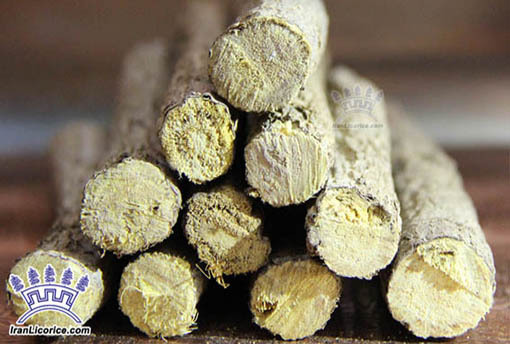 Spanish Liquorice root is in long, straight, nearly cylindrical, unpeeled pieces, several feet in length, varying in thickness from 1/4 inch to about 1 inch, longitudinally wrinkled, externally greyish brown to dark brown, warty; internally tawny yellow; pliable, tough; texture coarsely fibrous; bark rather thick; wood porous, but dense, in narrow wedges; taste sweet, very slightly acrid. The underground stem which is often present has a similar appearance, but contains a thin pith. That from Alicante is frequently untrimmed and dirty in appearance, but that from Tortosa is usually clean and bright looking. When peeled, the pieces of root (including runners) are shorter, a pale yellow, slightly fibrous externally, and exhibit no trace of the small dark buds seen on the unpeeled runners here and there. Otherwise it resembles the unpeeled. Nearly all the Russian Liquorice reaching this country has been peeled. It attains a much larger size than the Spanish, and the taste, although sweet, is accompanied by a more or less perceptible but not strong bitterness or acridity. It consists chiefly of roots, not runners, in long often crooked pieces, about 2 inches in thickness, pale yellow externally and internally of a lighter yellow than the Spanish and softer. The size of all cells (when examined microscopically) is seen to be much larger than in the Spanish. —Extract—The manufacture of Liquorice Juice, or Extract, is conducted on a liberal scale in Spain, southern France, Sicily, Calabria, Austria, southern Russia, Greece and Asia Minor, but the Extract with which England is supplied is almost exclusively the produce of Calabria, Sicily and Spain; Calabrian Liquorice is generally preferred. By far the larger part of the Italian and Sicilian crop is now manufactured there and exported in the form of Extract. Spain formerly yielded most of the supply, hence the Extract is still termed ‘Spanish Juice,’ but that of the first grade has long since depleted to the point of scarcity. 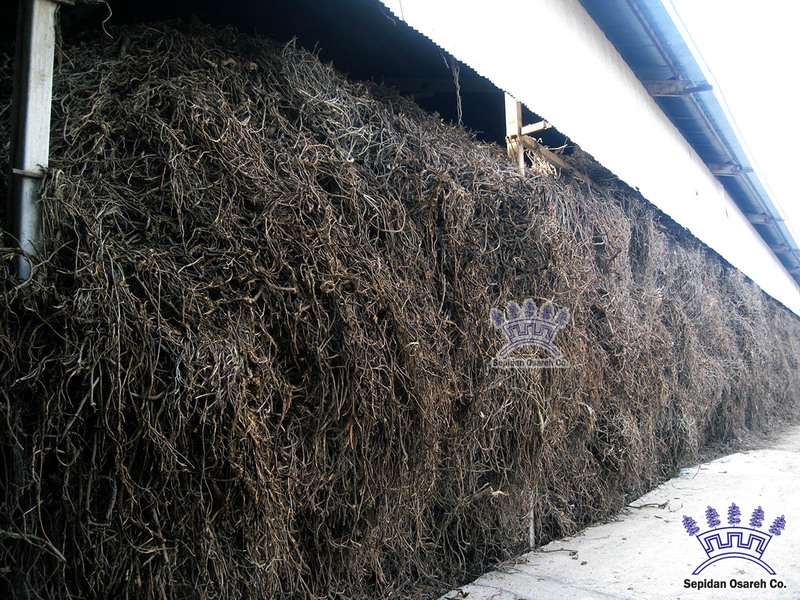 The roots and runners of both wild and cultivated plants are taken up in late autumn and stacked through the winter in the cellars and yards of the factories. 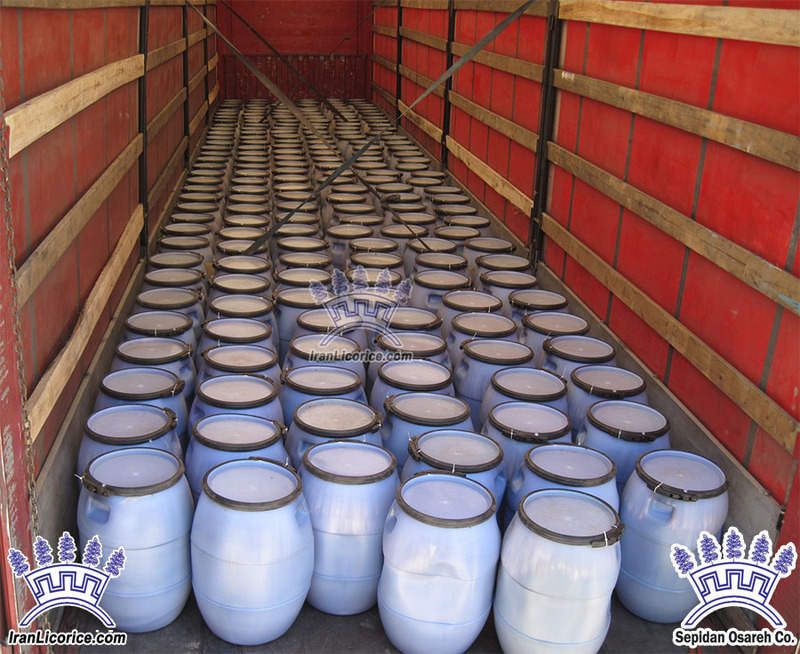 When required, they are crushed under millstones to a pulp, then transferred to boilers and boiled in water over a naked fire, the decoctions are run off and then evaporated in copper vessels over direct heat, till a suitable consistency is obtained, being constantly stirred to prevent burning. While warm, the mass is taken out and rolled into sticks, stamped and stacked on boards to dry. Vacuum pans and steam power have in some factories replaced the more simple methods. The sticks vary in size, but are commonly about 1 inch in diameter and 6 or 7 inches in length and when imported are usually wrapped in bay leaves. At one end they are stamped with the maker’s name or mark. Stick Liquorice is very commonly impure, either from carelessness in its preparation, or from the fraudulent addition of other substances, such as starch, sand, carbonaceous matter, etc. Small particles of copper are also sometimes found in it. Several varieties of Stick Liquorice are met with in English commerce, the most famous is the Solazzi Juice, manufactured at Corigliano, a small town of Calabria in the Gulf of Toranto. The juice is also imported in a black form, having while warm and soft been allowed to run into the wooden cases of about 2 cwts. each, in which it is exported. This juice, known as Liquorice Paste, is largely imported from Spain and Asia Minor, but on account of a certain bitterness is unsuited for its use as a sweetmeat or in medicine, and is principally employed in the preparation of tobacco for chewing and smoking. Extract of Liquorice in rolls has a black colour, is somewhat glossy and has a sharp and shining fracture. Some small cavities are found in the interior. The product of the different manufacturers of Stick Liquorice differ from one another not only in size, but often in the odour and taste; while some specimens are almost purely sweet, others are persistently acrid, rendering them unsuitable for medicinal purposes, for which they must be almost devoid of acridity. Hard Extract of Liquorice, as described, is essentially different in composition and properties to the Extract of Liquorice of the British Pharmacopceia, which is entirely soluble in cold water, whereas the so-called Spanish Juice, when treated with cold water, leaves a large residue undissolved, retaining the shape of the stick. The amount soluble in cold water varies considerably and reaches in the best brands about 70 or 75 per cent. The United States and nearly all other Pharmacopoeias recognize the commercial Extract of the root of G. glabra, but the British Pharmacopoeia does not, and gives a process for making an extract which somewhat resembles the purified Extract of Liquorice of the United States Pharmacopoeia. For the Liquid Extract of Liquorice, the British Pharmacopceiadirects the exhaustion of the Liquorice root with two successive portions of cold water, using each time 50 fluid ounces for 20 OZ. of the drug and allowing the mixture to macerate for 24 hours before expressing. The mixed infusions are heated to boiling point, strained through flannel and evaporated until the liquid has acquired, when cold, a specific gravity of 1.2, one-fourth of its volume of alcohol is added, and the mixture is set aside for 12 hours, after which it is filtered. It has a yellowish-brown colour and a pure sweet taste, free from all acridity. —Constituents—The chief constituent of Liquorice root, to which its sweet taste is due, is Glycyrrhizin (6 to 8 per cent), obtainable in the form of a sweet, white crystalline powder, consisting of the calcium and potassium salts of glycyrrhizic acid. The drug also contains sugar, starch (29 per cent), gum, protein, fat (0.8 per cent), resin, asparagin (2 to 4 per cent), a trace of tannin in the outer bark of the root, yellow colouring matter, and 0.03 of volatile oil. The amount of Glycyrrhizin present in Extract of Liquorice varies from 5 to 24 per cent, and the amount of moisture from 8 to 17 per cent. Upon ignition, the extract yields from 5 to 9 per cent of ash. The roots of G. glandulifera and echinata also contain in addition, Glycyrmarin, a bitter principle occurring mostly in the bark. Glycyrrhizin, or a similar substance, has been obtained from other plants, viz. from the rhizome of Polypodium vulgare, the leaves of Myrrhis odorata, and the bark of Lucuma glycyphloea. —Medicinal Action and Uses—The action of Liquorice is demulcent, moderately pectoral and emollient. The Extract enters into the composition of cough lozenges and pastilles, with sedatives and expectorants. It is largely used in conjunction with infusion of linseed in the treatment of irritable cough, sore throat and laryngitis, and an infusion made by boiling 1 OZ. of the bruised root deprived of its bark, with 1 pint of water for a few minutes, may be employed in the treatment of sore throat and in catarrhal conditions of the urinary intestinal tracts. Fluid Extract of Liquorice is employed almost exclusively as a vehicle for disguising the taste of nauseous medicines, having a remarkable power of converting the flavour of acrid or bitter drugs, such as Mezereon, Quinine or Cascara. The powdered root is useful in pill-making on account of its absorbent qualities, being used to impart stiffness to pill masses and to prevent the adhesion of pills. As a remedial agent, powdered Liquorice root has been almost entirely replaced by the extract, though it is used in the well-known Compound Liquorice Powder, the mild laxative in which Senna and Fennel are the other ingredients. It is added mainly on account of its sweetness and emollient qualities, the action of the powder being mainly due to the Senna contained. Liquorice was prescribed by early physicians from the time of Hippocrates, in cases of dropsy, to prevent thirst, for which it is an excellent thing, though probably the only sweet substance that has this effect. It is thought, however, that the property does not actually belong to the saccharine juice, but that if a piece of the root be chewed till all the juice is extracted, there remains a bitter, which acts on the salivary glands, and this may contribute to remove thirst. The sugar of Liquorice may safely be taken by diabetic patients. On the whole, Liquorice as a domestic medicine is far more largely used on the Continent than in Great Britain. It is much used in China and largely produced (both L. glabra and L. echinata) in some of the northern provinces, a variety of medicinal preparations being employed, not only as possessing tonic, alterative and expectorant properties, but also for the rejuvenating and highly nutritive qualities attributed to it. It was recommended by Gervase Markham, a noted authority on husbandry and farriery in the early part of the seventeenth century, for the treatment of certain horses’ ailments. —Preparations and Dosages—Powdered root, 1/2 to 1 drachm. Fluid extract, 1 to 4 drachms. Comp. powder, B.P., 1 to 2 drachms. Solid extract, 1 drachm. Comp. lozenges, U.S.P. Solid extract in stick form, known as Liquorice Juice. Liquorice is also largely used by brewers, being added to porter and stout to give thickness and blackness. Block Liquorice is employed in the manufacture of tobacco for smoking and chewing. According to the United States press, a new use for Liquorice Root has lately been discovered, the waste root being now utilized for the manufacture of boards for making boxes. After extraction of the Liquorice, the crushed root was formerly considered a waste product and destroyed by burning, but under a recently discovered process this refuse can now be made into a chemical wood pulp and pressed into a board that is said to have satisfactory resisting qualities and strength.